We’re nearing the end of January. How are those goals coming? For many of us, we had the best intentions of getting organized and focused in 2018 only to have more work pile up and curveballs thrown at us, leaving us feeling a little overwhelmed. But what if we could get really clear on where we should be spending our energy? 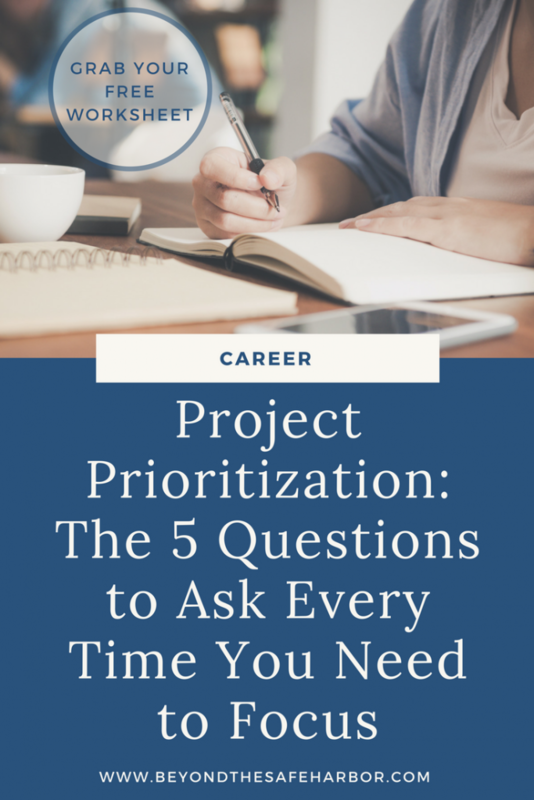 Project prioritization may sound boring but it can be LIFE CHANGING. Having absolute certainty as to where we should focus and a clear list of tasks is empowering and freeing. And today I’ll be showing you how to do just that! Question #1: How does this align with my goals and objectives? The very first step in assessing any task is to figure out its strategic importance. In other words, how does it align with your broader goals? Does accomplishing it help you meet your objectives? Looking at my blog for example, one of my tasks is to write at least two new posts every week. This aligns really well with my goals of creating content, publishing it on a consistent basis, and building a habit of writing. On the other hand, something like going through and deleting old photos on my phone doesn’t align as well. Yes, it would free up space on my phone, but it’s not really aligned to any of my goals. This is something I should de-prioritize. Looking for guidance on setting goals goals that you can actually achieve? Check out this post! Question #2: If I didn’t do this, what would happen? This is a key question to assess the big picture impact of the project or task. By asking this question, we’re getting at the domino effect of completing (or not completing!) something. And looking at how it connects with other moving pieces. Taking the example from Question #1, writing at least two posts per week has a significant big picture impact. If I didn’t do it, my blog would lack fresh content, missing an opportunity to drive traffic, help my audience, and engage my readers. At this stage of my blog’s life, growing my traffic is my top priority. And without content, that’s challenging to accomplish. A task like creating a 6-month editorial calendar may not rank as high. Yes, it’s always wise to plan ahead, but if I’m already planning say, 3 months ahead, that’s probably sufficient. I may ideally like to have that much content planned, but if I stick with a 3-month view, there won’t be any negative consequences. Question #3: How does this relate to my other projects? Building on Question #2, we’ll be looking at the interaction of the task with others. More specifically, how does the project or task relate to others and how are they linked? I recently took an online SEO course. Before taking it, I spent some time thinking about how it would relate to other areas of my blog. I realized that my newfound SEO knowledge would change the way I choose what to write about, how I title my posts, the keywords I use, and how I promote them. That’s a lot of touch points with something – content! – so central to my blog. For that reason, it may be worth prioritizing. Updating my About page, on the other hand, while strategically important, may not rank as high on this question. That’s because it operates in somewhat of a silo, existing as a single page on my website that I can update at any time without direct impact to other components. Question #4: How important is it that I do this soon? How that we’ve looked at the task’s strategic importance, big picture impact, and interaction with other projects, it’s time to assess its urgency. How critical is it that you complete this task in the near term? It may be important, but can it wait? For example, for months I’ve been wanting to create a product to sell on my blog. I already have some ideas and I’m really looking forward to putting together something more substantial and thorough than a post. And while it’s important to me that I create one, it’s not at all urgent. There are other things I should be focusing on in the short term to better set myself up for success to launch a product down the road. On the other hand, completing that SEO course I mentioned earlier would rank high on this question. Completing it soon would mean more blog posts are written the right way from the start, versus having to update them later on. Question #5: If I accomplished this task, would it make everything else easier? Ahh, efficiency. One of my favourite words! This question is all about the potential of completing a task to make your life a whoooole lot easier. When I went through this exercise, one of my tasks was to set up a batch blogging schedule. This would have me writing content a few posts at a time, and then doing more menial tasks for a bunch of posts together in a larger batch. I was able to structure my work around my best times and focus on specific things for each hour versus trying to complete a set of varied tasks in a short time span. It’s made blogging easier, more fun, and way more efficient. There are often only a handful of tasks that rank high on this question and they often have to do with setting up systems, doing audits or analyses, and goal setting. One-off tasks like investigating trademarking your name or updating old content may be worth doing, but just not rank as high on this particular measure. There are many different ways to actually assess and rank your projects or tasks, but my favourite way is to use a table. 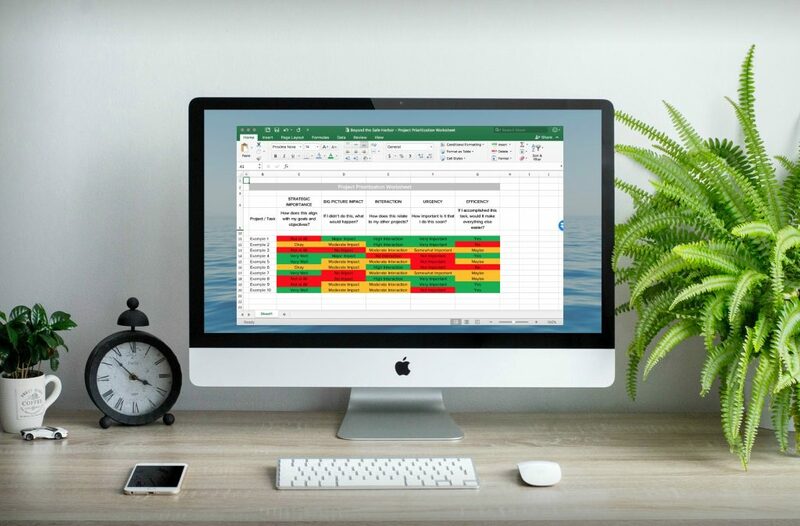 To do this, open an Excel file and dump in all your to dos, tasks, projects, and obligations. Enter one per row all in a single column which you label “Tasks” or “Projects” at the top. Then, create five columns to the right of this first column. At the top of each, write one of the five questions shared above. Next, go through and assess each task. You can either go row by row, and assess each task according to the five questions. Or you can go through each column (question) and assess how each tasks performs against it. Your choice! For each task, give it a colour score: green means it scores well, orange means it scores OK, red means it scores poorly. Then, take a look at which tasks naturally rise to the top by having the most green. Keep in mind that question #5 holds extra weight. Rank every single item from highest priority to lowest priority. No ties are allowed! Each item must be ranked. If you’d like, reorder your list based on rank. Then, get started on the highest priority task and work your way down the list. To make it easy, I’ve created a FREE Project Prioritization Worksheet that you can download to get started! It’s designed in Excel, but feel free to print it out if you’d like something to fill in by hand. And there you have it! With a little bit of time and a good amount of rigour, you have a fully prioritized list of projects. Leave us a comment sharing how you prioritize and plan your work schedule! Looking for templates, planners, and printables to help you live your best life? Grab your password and unlock my FREE resource library full of helpful tools! First Name E-Mail Address Yes, sign me up for the Beyond the Safe Harbor email newsletter. You will receive my latest updates, tips, and solutions for living your best life. Beyond the Safe Harbor is a participant in the Amazon Services LLC Associates Program, an affiliate advertising program designed to provide a means for us to earn fees by linking to Amazon.com and affiliated sites.